Mopar Performance Exhaust 05-10 Charger, Magnum, 300 6.1L 05-10 Chrysler 300C 6.1L Mopar Performance Exhaust Kit, 05-08 Dodge Magnum 6.1L Mopar Performance Exhaust Kit, 06-10 Dodge Charger 6.1L Mopar Performance Exhaust Kit, 05-08 Dodge Magnum 6.1L Exhaust System, 06-10 Dodge Charger 6.1L Exhaust System, [Mopar P5153574 Exhaust Kit] - $1,639.95 : 3rd Strike Performance, Your Source for Late Model MOPAR Performance Parts and Accessories! 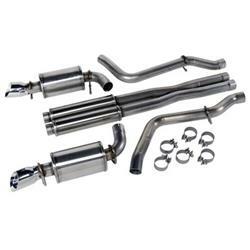 Mopar Performance cat-back exhaust systems, including the muffler, feature aircraft-quality T304 stainless steel construction with mandrel-bent tubing, stainless band (torca) clamps, and polished tips (unless otherwise noted). These free-flow systems provide horsepower and torque gain, improved fuel economy, and a deeper tone. Intermediate Pipe Diameter (in): 2.750 in. Tailpipe Diameter (in): 2.750 in. Tip Outlet Size: 4.000 in. Notes: Kit includes resonator and polished mufflers. Must re-use original equipment rubber insulators.